Bet Hatikvah, the small town that is the setting for The Band's Visit, is utterly unremarkable. But "unremarkable" is the last adjective one would use to describe the score for this new musical, about an Egyptian police orchestra who, thanks to a linguistic mix-up, find themselves stranded overnight in a tiny Israeli town. Written by Tony nominee David Yazbek, the music ranges from haunting and ethereal to rousing and comedic, weaving together the structures and storytelling needs of musical theatre with melodies and orchestrations that are undeniably, authentically Middle Eastern. The end result is a score that takes a moment to absorb fully, but once it does, it's hard to stop thinking about. "Waiting" and "Welcome To Nowhere" kick off the album with back-to-back odes to the monotony of life in Bet Hatikvah. "Waiting," the opening song, introduces us to the town's residents who have one thing in common: a feeling of being stuck. It also introduces us to one of Yazbek's best instruments throughout the score: the pure, powerful, haunting chorus of voices. Where "Waiting" is reflective, as the residents describe their own lives internally, "Welcome To Nowhere" is sarcastic and biting, as they introduce their stranded Egyptian guests to the town. It's filled to the brim with wry lyrics such as "Pick a sand hill of your choosing / Take some bricks that no one's using / Build some buildings, put some Jews in." Pairing these songs back-to-back gives a pretty good overview of the musical as a whole: half earnest yearning, half sharp comedy. Later in the album, we get another set of perfectly paired songs: "Papi Hears The Ocean," sung by Etai Benson, and "Haled's Song About Love," sung by Ari'el Stachel. There may not be a funnier or better-matched buddy duo on Broadway right now than Benson and Stachel, and their pair of songs is one of the best parts of the whole album. As Papi, Benson is endearingly awkward, even as he masterfully trips through the tongue-twisting patter of his song, a sweet and hilarious explanation of Papi's inability to connect with girls. Stachel's Haled is the perfect foil, with a crooner's smooth, jazzy tones that glide through his explanation of the secrets of love: "don't break the ice, you melt the ice." Their pair of songs are a perfect storm of humor, heart, and that shared human longing to love and be loved - who could ask for anything more? Read the full BroadwayWorld review here. Breaking news for Broadway theatergoers, even — or perhaps especially — those who thought they were past the age of infatuation: It is time to fall in love again. One of the most ravishing musicals you will ever be seduced by opened on Thursday night at the Barrymore Theater. It is called “The Band’s Visit,”and its undeniable allure is not of the hard-charging, brightly blaring sort common to box-office extravaganzas. With songs by David Yazbek and a script by Itamar Moses, “The Band’s Visit” is a Broadway rarity seldom found these days outside of the canon of Stephen Sondheim: an honest-to-God musical for grown-ups. It is not a work to be punctuated with rowdy cheers and foot-stomping ovations, despite the uncanny virtuosity of Mr. Yazbek’s benchmark score. That would stop the show, and you really don’t want that to happen. Directed by David Cromer with an inspired inventiveness that never calls attention to itself, “The Band’s Visit” flows with the grave and joyful insistence of life itself. All it asks is that you be quiet enough to hear the music in the murmurs, whispers and silences of human existence at its most mundane — and transcendent. As the composer and lyricist of such high-octane Broadway musicals as The Full Monty, Dirty Rotten Scoundrels, and Women on the Verge of a Nervous Breakdown, David Yazbek has mostly been, he says, “able to rely on Faster, Louder, Funnier.” Yazbek had to abandon that credo for The Band’s Visit, the quietly ravishing new musical, written with Itamar Moses, that, after a rapturously received run at the Atlantic Theater last season (it beat Dear Evan Hansen for the New York Drama Critic Circle’s Best Musical Award), opened on Broadway last month. Read the full article at Vogue. The original Broadway cast recording for The Band's Visit will be released later this year on Ghostlight Records. An official release date for the album has yet to be announced, but fans of the new musical can sign up for updates here. David Yazbek and Itamar Moses’ The Band's Visit is currently in previews at the Ethel Barrymore Theatre, where it began performances October 7 and will officially open November 9. David Cromer directs. 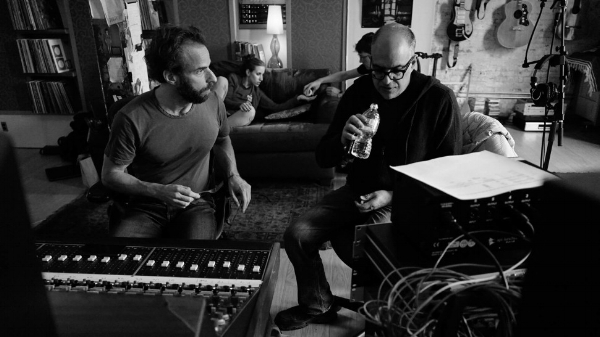 Ghostlight founder Kurt Deutsch will serve as the album’s executive producer, with Yazbek and Grammy-nominated producer Dean Sharenow attached as producers. The Band's Visit arrived on Broadway this fall following an acclaimed and sold-out world premiere at Atlantic Theater Company last year. Though the Off-Broadway production was a hit, no cast album was recorded. The Broadway company features much of the original cast, and is made up of Katrina Lenk, Tony Shalhoub, John Cariani, Ari'el Stachel, George Abud, Etai Benson, Adam Kantor, Andrew Polk, Bill Army, Rachel Prather, Jonathan Raviv, Sharone Sayegh, Kristen Sieh, and Alok Tewari. Read the full Playbill article here. Performers can spend the breadth of their careers waiting, hoping, to originate a role on Broadway. When “The Band’s Visit” opens at the Ethel Barrymore Theatre this fall, its star, Katrina Lenk, will have done it twice—in a matter of seven months. It’s a grounded appraisal from someone who can attest to the rarity of this once-in-a-career perfect storm. Lenk is not an ingénue or overnight success. Between stints in Los Angeles and Chicago and her tenure in New York, she’s worked diligently for years in television and film, and understudied and replaced others in theater. But it wasn’t until last season’s starring role in Paula Vogel’s Tony-nominated “Indecent” (which she’d previously played Off-Broadway) that she became a lightning rod for New York City’s attention. Now, in David Yazbek and Itamar Moses’ “The Band’s Visit,” which she’ll be revisiting in its Main Stem incarnation after starring Off-Broadway, Lenk will lead a musical on Broadway for the first time and step into a role that’s poised to change her life. Read the full interview with Katrina at Backstage! Quiet may well be the new loud in the world of show tunes. Unexpectedly, one of last season’s most acclaimed new musicals, “The Band’s Visit,” did not feature flashy choreography or cathartic 11 o’clock belters. Based on the 2007 art house film of the same title, the show, which played Off Broadway at the Atlantic Theater, is a low-key charmer in which looking at someone in silence carries as much emotional weight as delivering one of David Yazbek’s insidiously catchy songs. Mastering both was Katrina Lenk, as the sultry owner of the lone cafe in a dead-end Israeli town, who has a brief encounter with a group of marooned Egyptian musicians, led by Tony Shalhoub. Fortunately, Ms. Lenk is now getting ready to reprise her performance at the Ethel Barrymore Theater, where the show starts Broadway previews on Oct. 7. 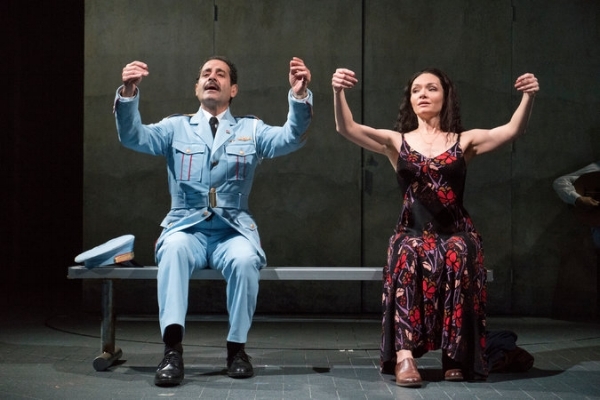 Myriad names from the Off-Broadway world premiere of The Band’s Visit will reprise their performances when the critically acclaimed musical transfer to Broadway this fall. Leading the cast will be three-time Tony nominee Tony Shalhoub and Katrina Lenk, currently on Broadway in Indecent. Shalhoub (The Price) will play Tewfiq—the leader of an Egyptian police band stranded in a small desert town in Israel, while Lenk (Once) takes on the role of Dina, one of the locals who take in the traveling musicians as the two groups form an unexpected bond. Also returning to the show are George Abud (The Visit) as Camal, Bill Army (Act One) as Zelger, Tony nominee John Cariani (Something Rotten!) as Itzik, Andrew Polk (Burning) as Avrum, Rachel Prather (Once)as Julia, Jonathan Raviv (Martyrs Street) as Sammy, Sharone Sayegh (Mamma Mia!) as Anna, Kristen Sieh (The Fortress of Solitude)as Iris, Ari’el Stachel (We Live in Cairo) as Haled, and Alok Tewari (Awake and Sing!) as Simon. The company will also include music director and pianist Andrea Grody, as well as band members Alexandra Eckhardt, Philip Mayer, Sam Sadigursky, Jeff Theiss, Harvey Valdes, and Garo Yellin. Compelte casting will be announced at a later date. Performances will begin October 7 at the Ethel Barrymore Theatre, where the musical is set to officially open November 9. To purchase tickets, click here. Read the full article at Playbill. Final casting has been announced for the Broadway production of the critically acclaimed musical THE BAND'S VISIT, arriving on Broadway in Fall 2017 at the Ethel Barrymore Theatre (243 West 47th Street). Joining the previously announced Katrina Lenk, Tony Shalhoub, John Cariani, Ari'el Stachel, George Abud, Andrew Polk, Bill Army, Rachel Prather, Jonathan Raviv, Sharone Sayegh, Kristen Sieh and Alok Tewari are Etai Benson (An American in Paris) as "Papi" and Adam Kantor (Fiddler on the Roof) as "Telephone Guy." Musicians will include Andrea Grody (Music Director/Piano), George Abud (Violin, Oud, Darbuka), Alexandra Eckhardt (Bass), Philip Mayer (Drums, Arabic Percussion), Sam Sadigursky (Clarinet, Saxophones, Flute), Jeff Theiss (Associate Conductor/Keyboard), Harvey Valdes (Guitar) and David Garo Yellin (Cello). Pomme Koch and Madison Micucci will understudy for THE BAND'S VISIT.